Many data center professionals today have a myriad of dashboards displaying an overwhelming volume and variety of data from multiple different systems—just for operating and monitoring their data centers. But what if Data Center Infrastructure Management (DCIM) software could be the difference between spending countless hours sifting through spreadsheets and finding the data you need with just a click of a button for an immediate, complete picture of your data center? 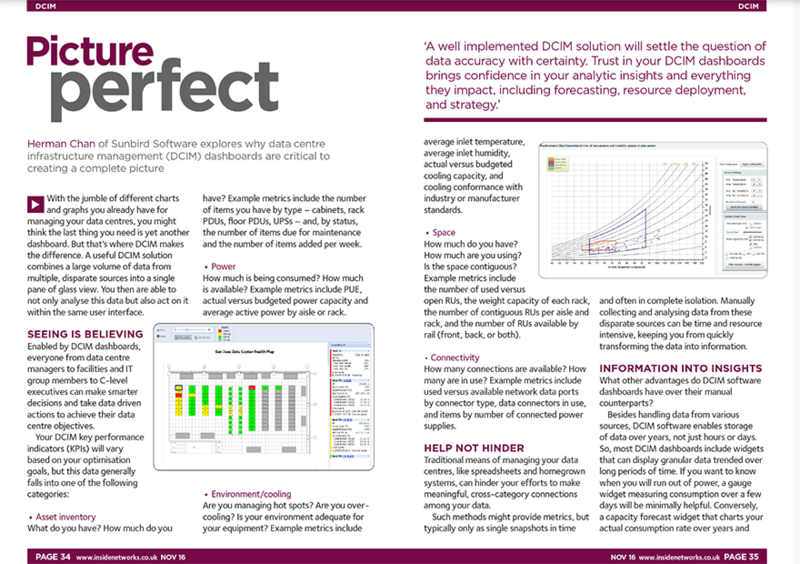 Our President Herman Chan tackled this topic in an article exploring the benefits and opportunities of DCIM dashboards in the November 2016 issue of Inside_Networks, an online magazine dedicated to IT network infrastructures that brings the latest industry news and expert opinions to data center owners and managers, ICT directors, consultants, installers, integrators, and anyone else interested in data center and IT network optimization. Titled “Picture Perfect,” the article explores why DCIM dashboards are critical to creating a complete picture of a data center. It touches on the five main categories of DCIM Key Performance Indicators (KPIs) and example metrics, the advantages of DCIM dashboards over spreadsheets and homegrown systems, proven tips and best practices for driving user adoption and maximizing usefulness, and real-world examples of how DCIM software can help to ensure that the data collected is high quality, accurate, and complete. Want to learn more about how to create DCIM dashboards that drive data center efficiency? Download the article here or request a demo today.